How many places have you seen advertising these days about buying your gold? How many of those places seem reputable and safe? How many of those places can you say will be around ten years from now? Design One has been buying gold, diamonds and all manner of precious metals for thirty-five years. We are not in the “gold rush” to make a quick buck. This is not a major portion of our business, but we have been doing this since the day we opened our doors. We want you to have a safe and secure place to take your treasures and sell them, knowing that we will give you top dollar and we spend the time going through each and every piece, so you know that you are being treated fairly. One of the big things about selling jewelry is knowing how it all works. We do it all the time but you don’t, so we will explain it every step of the way. The nice thing is that you can come it and let us sort through your belongings, right in front of you. If, at the end of it all, you change your mind and decide not to sell, we understand and send you off with a smile. If you decide to sell any or all of your pieces, we give immediate payment. How much is my gold really worth? The only way to confidently say what your gold is worth is if we look at it. If you bring your gold into our store, we will look at your materials and sort them out in front of you. We will then explain what kind of gold you have and what it is worth. It is paramount to make sure that all our customers understand what it is they have, the various karats they have, and their value. Will I get the same price for gold as I saw on the news? The price of gold on the news is based on pure .999 gold. If you have 24k (pure) gold, you will get very close to that amount as per the weight of the item. If your gold is a lower karat, it will have a lower value compared to that price per ounce. Also, the price of gold varies on a daily and hourly basis. The simplest way to tell you what your gold is worth is to come in with what you have and we can give you an estimate free of charge. Will you pay the same amount that I saw in another jeweler's ad? We don’t match any price, but what we offer for gold is always very competitive. Remember, not every gold buyer is the same, and the price they offer you may be misleading. No one who plans to stay in business will pay you more than what the gold is worth, and no one is NOT going to make a profit on the metals. Some businesses may offer you a premium based on doing other business in their establishments. That’s fine but that’s not the way we work. We offer you a price based on fair market value, regardless of whether you do more business at our counter or take the money and run. Our success rate speaks for itself and many people who get a quote from us, return to sell, even after shopping with our competitors. It is imperative for our success that we do the best that we can for every customer. It builds trust and relationships, and you’ll recommend us. With over 35 years of experience buying gold in every market, we have great confidence in saying that our prices are always fair. We will always take the time to help you understand why and how we come up with our offer. If I sell you gold with stones in it, what happens to the stones? We look at each piece of jewelry individually. Depending on the color, clarity and worth, some stones have value and some do not. While we are assessing the value of your gold, we can also tell what the stone is worth. If you are selling a piece of jewelry with a stone that you want to hold on to (e.g. you are selling the gold in a gold ring, but want to hold on to the diamond), we will gladly and safely remove it for you promptly. We do not alter our prices on the metal if you remove the stone, however, many pieces that have smaller diamonds will have a higher dollar amount put on the metal. At the end of the day, we want you to be happy with your decision. How do you know what kind of gold I have? First, we look at the gold’s color and for any stamps (e.g. 585 or 14k), but that’s just to give us a starting point. We don’t rely on that, because not all gold is stamped accurately. We can make a small file mark on your jewelry and apply the acid directly to it. If you have 14k gold and we apply 14k acid to it, it will not change the surface of the metal in any way. The only time we see a reaction is if it is a lower karat than marked or if it’s plated. How the acid and metals react give us the answer to what karat your jewelry may or may not be. Between our experience with working with all metals and the use of acids as a checks and balance system, our appraisals are highly accurate. Many electroplated pieces can be very deceiving to the naked eye, especially if you’re not used to seeing the difference on a daily basis. That’s why we offer to sort your jewelry for you and in front of you. If a piece is plated, it does not have gold value, as that plating is very thin and cannot be separated from the base metal underneath. 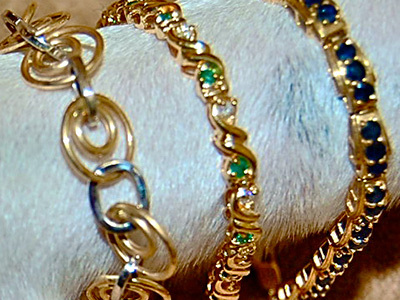 On the same vein, we have plucked many a real gold piece from the midst of what people thought was “junk” jewelry. Do you only buy gold jewelry? We buy anything of a precious metal nature, be it gold, silver or platinum. 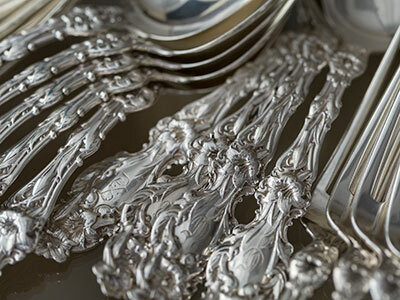 This includes old estate platinum jewelry, gold and silver coins, white and rose gold, sterling silver flatware, platters, bowls, gold watches, dental and scrap gold. If you’re not sure what you have, give us a call. We’ll gladly help you figure it out.